Immunotherapy is exactly what it sounds like: using the body's immune system to combat disease. Normally, cancer inhibits the immune response by leveraging CTLA-4, a receptor on T cells that, when activated, block an immune response and allow tumors to grow. 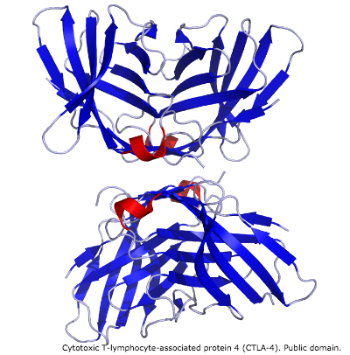 In the 1990s, James Allison a researcher and professor at the University of California, Berkeley developed an anti-CTLA-4 antibody that, in mice, overrode the CTLA-4 "checkpoint" and allowed tumor-shrinking T cells to go to work. Fast forward to the present. Dr. Allison is the chair of the immunology department at the University of Texas MD Anderson Cancer Center. His innovation is the basis for a class of drugs -- checkpoint inhibitors -- that some speculate could pave the way for cures. The checkpoint inhibitors are a game changer. Instead of a Space Invaders approach in which drugs target specific cells, the new class of drugs takes more of a "release the hounds!" approach by activating patients' own defenses against the illness. Drugs like Bristol-Myers' Squibbs' Yervoy have extended the lives -- and quality of life -- by years for patients diagnosed with late stage melanomas. The drugs have had such a profound impact on a subset of the patients using it that they've been dubbed "super-survivors" and the investment world has taken note especially because the approach seems to apply to a range of cancers. Standard and Poor's released a report on the top 10 drug prospects for 2015, and half of them are checkpoint inhibitors. Experts at Credit Suisse predict that Yervoy and its label-mate Opdivo could generate $8.5 billion in revenue for Bristol-Myers Squibb by 2020. Investors aren't only paying attention to known quantities like Bristol-Myers Squibb. Smaller companies have also begun to develop immunotherapy treatments. Besides CTLA-4, there are other receptors in the body for which a few start ups like Juno Therapeutics and bluebird are developing checkpoint inhibiting drugs. This is not to say that everyone prescribed a checkpoint inhibitor becomes a super-survivor. The drugs only work a subset of patients. Newer entrants into the field are exploring using combinations of treatments, including immunotherapies to reach a wider range of patients. Investors are betting that they'll work.